I was just talking to my husband the other day about the many beautiful and functional apps the Martha Stewart team has come out with lately and bingo, in my inbox this morning I heard about another one that I wanted to share with you! Hello Egg Dyeing 101 App, we're so happy to meet you. This App is hands down a complete paradise for a person who loves to dye eggs. It includes egg basics, techniques, instructions, gives resources, and even video clips that show you cool things like how to blow out an egg. 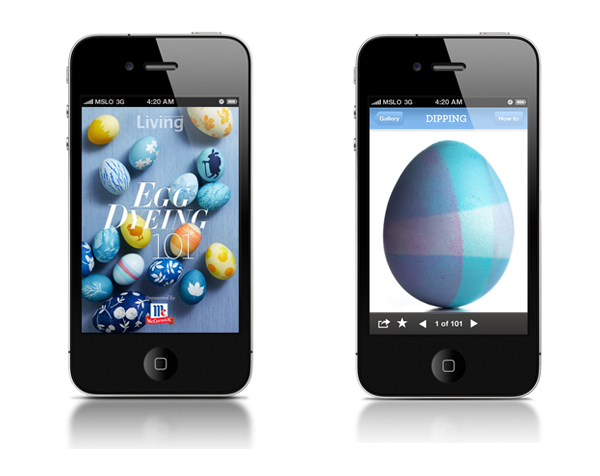 This app puts many of those great Martha Stewart Living Easter Egg ideas right in the palm of your hand allowing you to replicate them with pizzazz. I'm in love with the way they share how to marbleize, mask with lace, make creatures and more! What is pretty snazzy is that it is only $.99 and you can find it in the app store right here. Choose two or more dyes in hues that work together. 1) Start with an egg dyed in a pale color. 2) Dip the bottom of the egg into a darker dye, partly submerging it and holding it upright, until desired color is achieved. Remove egg, blot with paper towel, and set on a pin-board to dry, 10 minutes. For a two-tone egg, stop at this step. Or, if desired, turn the egg over and repeat, dipping the top in the same color, but leaving a band of the original color in the middle. 3) To further enhance the pattern, turn the egg on its side and dip it horizontally, until desired color is achieved. Remove egg, blot, and set on a pin-board to dry. Repeat as desired. “Photos from the Egg Dyeing 101 from Martha Stewart Living App. Copyright © 2011, Martha Stewart Living Omnimedia, Inc.” * I did receive the $.99 app for review purposes, but was not compensated for my personal opinion which is my own. Oooh, I'm excited to try that! ohh martha - she thinks of everything!! what pretty dyed eggs! COOL - thanks.. I'll love-link you for this hint.. Hope it's okay...? Leave it to Martha! No one does it like her. I think I need to get me an iTouch! Too stinking fun! Martha has been tweeting up a storm about this app, and I was wondering if I needed it. Thanks to you, I believe I do.